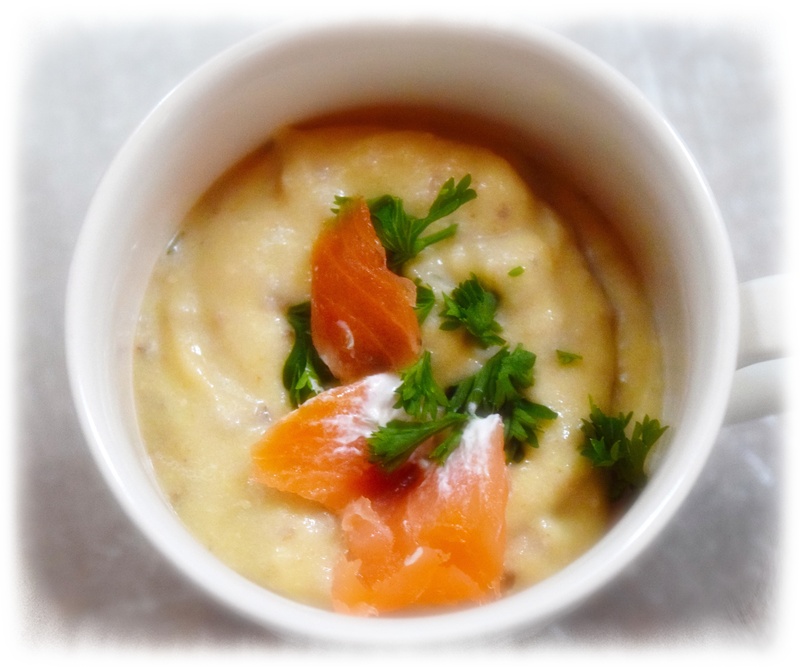 Today an amazing different take on potato soup recipes… from “Love your Leftovers” from Hugh Fearnley-Whittingstall and later potatoes with a little leftover Sunday roast beef hash for breakfast. Well, have you ever heard of potato peel soup? Not until today perhaps unless you survived a depression or worked at being a hobo…now don’t go hide your head in the sand it is surprisingly delicious, kind of like a heartier version of potato soup with a faint earthy mushroom background. Off course you can play with the recipe or note the changes that I made to the recipe…I used peels from 3 kinds of potatoes, red, russet & Yukon golds, I added a pod of Knorr chicken stock and 2 cups of water thought about adding corn and or bacon before I saw the smoked salmon and settled in salmon with water crackers as a side to go with the soup. I know that it sounds off the wall, but that recipe made a believer out of me and a few changeup options could work well in the future especially with the addition of corn. I’m sure that someone here would opt for some grated cheddar cheese. I had 3 small potatoes in the potato crock cubed them up for a little chunkier soup simmered until tender and added them to the whizzed up soup/immersion blender was perfect instead of handling hot stuff in a blender. Heat the butter or oil in a medium saucepan over a medium-low heat and add the onions, bay leaf and a good pinch of salt. Sauté gently, until the onions are soft but haven’t taken on any color, about 10 minutes. Add the potato peelings and pinches of ground black or white pepper, give everything a very good stir for a minute. Pour in the milk and stock, season well with salt and pepper and bring to the boil. 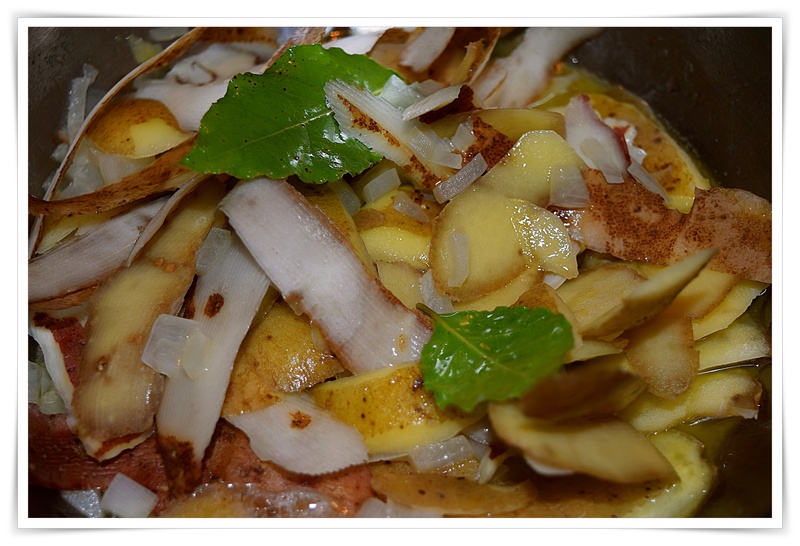 Reduce the heat and simmer gently until the peels are very tender – another 10-15 minutes or so. Remove from the heat and cool slightly, then purée in a food processor, blender or using a stick blender until very smooth. Return the soup to the pan and reheat gently. Season well with salt and pepper and stir in the chopped parsley, if using. Serve in warmed bowls, topped with fried sage leaves and shards of crisp-grilled bacon, if you like. Finish with a generous grinding of pepper. This recipe is not off the wall. Very interesting to use potato peel as the base. For a start, I should stop peeling potato to make soup. How interesting! Looks good with the salmon too. No-waste cookery going on here! ‘Love your leftovers’ was one of the two books of Hugh’s we used at Country Cooking Club, but I opted for ‘River Cottage Every Day’ ~ as there is only two of us at home with not much leftovers! Nice to be able to leave a comment for this post. Sorry, it should be The Cottage Cooking Club! Yes, most of the time it is just the two of us as well. I was staring at this and that potato and absolutely no waste since I used the peels and some cubed for a chunkier/thicker soup if you whizz it up. The rest f the peeled potatoes made a nice hash along with the Sundy rib roast leftovers.